Levallois Metropolitans (ProA) signed 27-year old Beninese power forward Mouphtaou Yarou (204-116kg-90, college: Villanova). 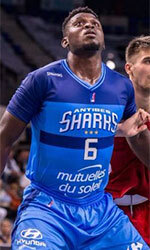 He will still stay in France where he played last season at played at Sharks Antibes. In 34 ProA games in France he had 12.9ppg and 9.1rpg. Good season as he was named League Player of the Week. The previous (16-17) season Yarou played at Le Mans. In 30 ProA games he recorded 6.0ppg and 5.6rpg. He helped them to make it to the cup final. Yarou also played 16 games in Basketball Champions League where he averaged 8.3ppg and 5.6rpg. Yarou has tried to make it to the NBA and played in the NBA Pro Summer League in 2016. The list of the past achievements is quite long as among others his team won French Cup in 2016. Yarou was also voted Eurobasket.com All-French ProA 2nd Team in 2016. He has played also professionally in Serbia (Radnicki 1950 Kragujevac). 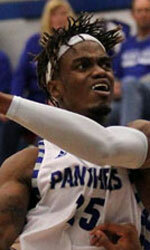 Yarou attended Villanova University until 2013 and it will be his sixth season as a professional player. He could be described: A gifted forward with a throwback approach to the game ... Is an effective post-up performer and relentless rebounder ... Possesses an uncanny feel for the sport. Good hands and shooting touch.